Home Politics Why Did General Muhammadu Buhari Jail Dr. Alex Ekwueme As Vice In 1983, Instead Of The Shehu Shagari Who Was President? 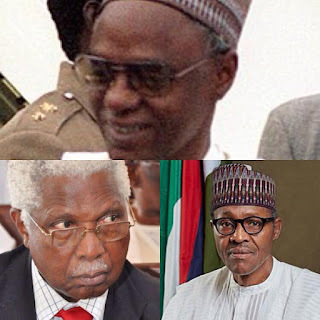 Why Did General Muhammadu Buhari Jail Dr. Alex Ekwueme As Vice In 1983, Instead Of The Shehu Shagari Who Was President? I just heard this morning that in 1983, then General Muhammadu Buhari jailed former Vice President, Dr. Alex Ekwueme, Who was Vice to Alhaji Shehu Shagari and I didn’t understand why? Jailing a Vice President after he took over that government through the instrumentality of a COUP, instead of the President on whose shoulders the responsibilities of government was, is incomprehensible to me and I have to ask men of wisdom to come to my aid here. WHAT WAS THE REASON GENERAL MUHAMMADU BUHARI JAILED ALEX EKWUEME AND NOT SHEHU SHAGARI IN 1983?